NEWTON — Ralph “Sonny” Barger, the legendary former leader of the Hells Angels motorcycle club, may be asked to testify for the state at the trial of a Missouri man with the same last name who is charged in the mistaken-identity kidnapping of a Newton businessman. Barger, who founded the Oakland chapter of the motorcycle club in 1957, would be asked to testify about letters that William Barger, 51, claims “Sonny” Barger wrote about the formation of a Hells Angel chapter in the Midwest, said Sussex County First Assistant Prosecutor Gregory Mueller. William Barger is accused of using the letters to enlist three men to kidnap Jeffrey W. Muller, a money broker from Mahwah. In a case of mistaken identity, the men allegedly kidnapped Jeffrey M. Muller of Newton. “He (Sonny Barger) had no involvement whatsoever” in the case, said Mueller. William Barger, also known as “Brutal,” allegedly told the men they would be considered for membership in the new Hells Angels motorcycle chapter if they kidnapped the money broker. William Barger, of Nevada, Mo., had hoped to recoup some of the $500,000 that was lost by Roy Slates, a Missouri businessman, to Jeffrey W. Muller in a business deal, authorities have said. As part of the deal, William Barger and the kidnappers would get to keep 25 percent of the amount collected. The kidnapping plot went awry when the three suspected kidnappers mistakenly abducted Jeffrey M. Muller, the owner of a pet supply store in Newton, on Jan. 8, 2010. In court papers filed by Mueller, Barger allegedly told the three men that he established the new Hells Angels chapter, the “Heartland,” with the permission of “Sonny” Barger, who William Barger claimed was his father. “In reality, no one associated with HAMC authorized the creation of a ‘Heartland’ chapter. Billy Barger was not related, in any way, to Sonny Barger. In fact, he didn’t even know him. The only club Billy Barger actually belonged to was the Masons. And, Billy Barger did not even own a motorcycle,” Mueller wrote on the court brief. 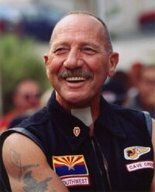 “Sonny” Barger, 75, who is still active in the Cave Creek, Az., chapter of the Hells Angels, was convicted in 1988 of conspiring to blow up the club house of a rival motorcycle gang in Louisville, Ky. He served four years in a federal prison following his conviction.